HTC 8X windows smartphone launched with WINDOWS 8 OS. It features 4.3-inch Super LCD 2 Capacitive Touchscreen with 1280x720 pixel resolution, 1.5 GHz Dual Core Qualcomm Scorpion processor with windows phone 8 OS, 8 Mega Pixel back camera for HD photo capturing and Video recording, 2.1 Mega Pixel Front facing camera for easy and super quality video chatting, WI-FI enabled,1 GB RAM memory,16 GB internal memory. 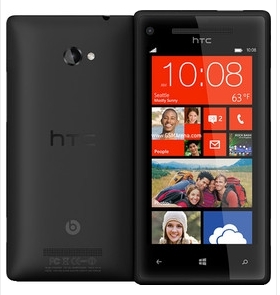 HTC 8X runs on windows 8 operating system it's give new look to HTC 8X. Adreno 225 Graphics enabled. Its music player supports WAV, eAAC+ and MP3 files. Video player plays MP4, 3GP, 3G2, ASF, WMV, H.264, M4V, H.263 and HD Video Playback. LED Flash available with camera HTC 8X enables GPRS, EDGE, Wi-Fi 802.11 a/b/g/n, USB connectivity - Micro USB & V2, GPS-A-GPS _ GLONASS, BLUETOOTH-V3.1 and Audio Jack 3.5 mm. instant messaging available.